Leading feminist scholars provide searching treatment of the long-neglected subject of gender and access to land in various regions around the world. A searching treatment of gender and access to land around the world. Includes contributions by leading feminist scholars in the field. Combines theoretical reflections with concrete case studies. Covers diverse regions, including sub-Saharan Africa, Latin America, South Asia and Central Asia. Several articles are based on original and extensive field research carried out over the past two years in, for example, South Africa, Uzbekistan and Brazil. Shahra Razavi is Research Coordinator at the United Nations Research Institute for Social Development (UNRISD), Geneva. She is the editor of the books, Gendered Poverty and Well-Being (Blackwell Publishing, 2000); Shifting Burdens: Gender and Agrarian Change under Neoliberalism (2002); and co-editor (with Carol Miller) of Missionaries and Mandarins: Feminist Engagement with Development Institutions (1998), and (with Maxine Molyneux) of Gender Justice, Development, and Rights (2002). 1. Editorial Introduction: Terence J. Byres and Henry Bernstein (both at University of London). 2. 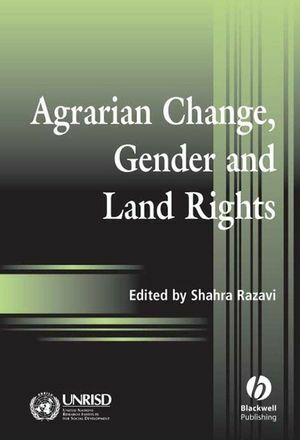 Agrarian Change, Gender and Land Rights: Shahra Razavi (United Nations Research Institute for Social Development (UNRISD), Geneva). 3. Global Capitalism, Deflation and Agrarian Crisis in Developing Countries: Utsa Patnaik (Jawaharlal Nehru University). 4. Policy Discourses on Women’s Land Rights in Sub-Saharan Africa: The Implications of the Re-turn to the Customary: Anne Whitehead (University of Sussex) and Dzodzi Tsikata (University of Ghana). 5. Piety in the Sky? Gender Policy and Land Reform in South Africa: Cherryl Walker. 6. Securing Women’s Interests within Land Tenure Reforms: Recent Debates in Tanzania: Dzodzi Tsikata (lives in Durham). 7. Gender and Land Rights Revisited: Exploring New Prospects via the State, Family and Market: Bina Agarwal (University of Delhi). 8. The Cry for Land: Agrarian Reform, Gender and Land Rights in Uzbekistan: Deniz Kandiyoti (University of London). 9. Women’s Land Rights and Rural Social Movements in the Brazilian Agrarian Reform: Carmen Diana Deere (Universty of Massachusetts).